Sea Change 2030 was an international ideas competition which showcased innovative planning, designing and managing for adaptation to urban sea level rise. The competition uses Sydney Harbour as its case study. augmented landscape explores an approach to climate change, which is both about protection and transformation of the landscapes we occupy. 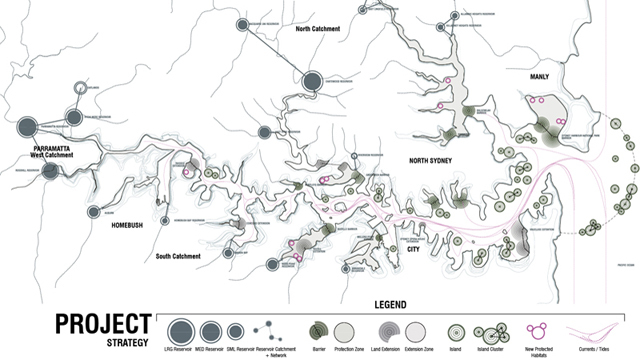 It has an inherent understanding of the landscape and infrastructural systems at play for the ongoing survival and productive transformation of the harbour foreshore and inter-tidal zones. It is a response to environmental change as a process of protecting vulnerable areas in the harbour catchments area, only to a point where protection is not viable any more and becomes a possible detriment to sustaining the way we live. In the post protection phase, new forms of habitation are considered through the construction and growth of a new living landscape; landscapes which emerge from the combination of the natural and artificial structures. These structures form the construction of floating reef islands and atoll ecosystems that have the ability to be continually responsive to tidal shifts and transformation in climatic conditions.